Barbers on South End. It opened some time between October 2017 and June 2018. The premises were previously occupied by Allen Court Business Centre photo, which housed the Croydon Jewellery School among other businesses. It then became a minicab firm called Courier Cars photo, which opened in January or February 2016 and closed down again some time between September 2016 and July 2017 photo. 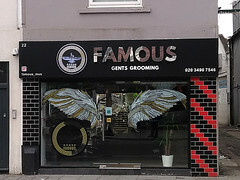 The premises were still vacant as of October 2017, but by June 2018 a barbers called Famous Gents Grooming had opened. Last edited 2019-01-06 14:27:58 (version 24; diff). List all versions. Page last edited 2019-01-06 14:27:58 (version 24).